I know. Another table. I’ll soon be expected to serve dinner at this rate. We regularly serve this kind of cake in Montreal. I have a table just like this, Carin! Cheryl, between your pictures of chairs and mine of tables, we could do a very funky furniture catalogue! It’s the little things that make a difference. I took photos of a table similarly snow-bedecked in our backyard recently, but yours with the chair drawn up to it is more effective. Don’t you love the way the snow forms those straight-sided mounds, like they were created in a giant cheesecake pan? I’m in admiration of the clever architectural instincts of snow, how it tapers just enough to keep standing. I wondered if it got high enough would it eventually be a pyramid? Say no more. It looks pretty drifted on a table, but not so pretty lumped on the end of a snow shovel. It’s about hope! And waiting! 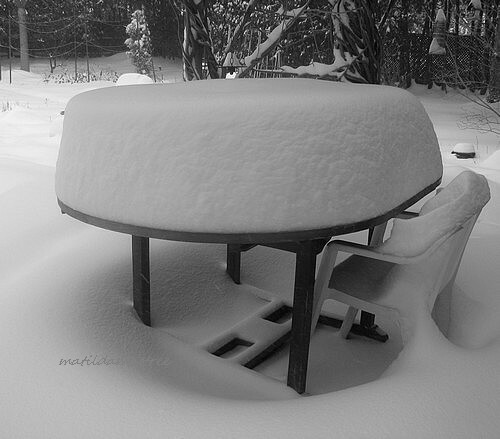 Not that I mind the snow, but I’m happy knowing spring and summer and sitting outdoors will happen again one day…. What a lovely sentiment, Kristen.